Atlanta, September 23, 2013 – The American Society for Radiation Oncology (ASTRO) today released its list of five radiation oncology-specific treatments that are commonly ordered but may not always be appropriate as part of the national Choosing Wisely® campaign, an initiative of the ABIM Foundation. The list identifies five targeted treatment options that ASTRO recommends for detailed patient-physician discussion before being prescribed. Don’t initiate whole breast radiotherapy as a part of breast conservation therapy in women age ≥50 with early stage invasive breast cancer without considering shorter treatment schedules. Whole breast radiotherapy decreases local recurrence and improves survival of women with invasive breast cancer treated with breast conservation therapy. Most studies have utilized “conventionally fractionated” schedules that deliver therapy over 5-6 weeks, often followed by 1-2 weeks of boost therapy. Recent studies, however, have demonstrated equivalent tumor control and cosmetic outcome in specific patient populations with shorter courses of therapy (approximately 4 weeks). Patients and their physicians should review these options to determine the most appropriate course of therapy. Don’t initiate management of low-risk prostate cancer without discussing active surveillance. Patients with prostate cancer have a number of reasonable management options. These include surgery and radiation, as well as conservative monitoring without therapy in appropriate patients. Shared decision-making between the patient and the physician can lead to better alignment of patient goals with treatment and more efficient care delivery. ASTRO has published patient-directed written decision aids concerning prostate cancer and numerous other types of cancer. These types of instruments can give patients confidence about their choices, improving compliance with therapy. Don’t routinely use extended fractionation schemes (>10 fractions) for palliation of bone metastases. Studies suggest equivalent pain relief following 30 Gy in 10 fractions, 20 Gy in 5 fractions, or a single 8 Gy fraction. A single treatment is more convenient but may be associated with a slightly higher rate of retreatment to the same site. Strong consideration should be given to a single 8 Gy fraction for patients with a limited prognosis or with transportation difficulties. Don’t routinely recommend proton beam therapy for prostate cancer outside of a prospective clinical trial or registry. Don’t routinely use intensity modulated radiation therapy (IMRT) to deliver whole breast radiotherapy as part of breast conservation therapy. Clinical trials have suggested lower rates of skin toxicity after using modern 3-D conformal techniques relative to older methods of 2-D planning. In these trials, the term “IMRT” has generally been applied to describe methods that are more accurately defined as field-in-field 3-D conformal radiotherapy. While IMRT may be of benefit in select cases where the anatomy is unusual, its routine use has not been demonstrated to provide significant clinical advantage. ASTRO’s Choosing Wisely list was developed after several months of careful consideration and thorough review, using the most current evidence about management and treatment options. A survey was sent to ASTRO’s Health Policy Council, Health Policy Committee, Clinical Affairs and Quality Committee, the Guidelines Subcommittee, Best Practices Subcommittee, Measures Subcommittee and disease-site resource panels in order to identify potential items for inclusion in the list. A seven-member work group was formed, with representation from ASTRO’s Clinical Affairs and Quality, Health Policy and Government Relations councils, and each work group member chose their top eight items from the total of 34 topics that had been suggested in the initial survey. The results were tabulated and a list of the highest scoring items created a short list of 13 draft items. Three conference calls were subsequently held to further refine the list and finalize the wording of the items based on input from ASTRO’s Board of Directors. An extensive literature review was conducted for each topic, and the work groups drafted the text and selected references for each topic. The final items for submission were approved by ASTRO’s Board of Directors. 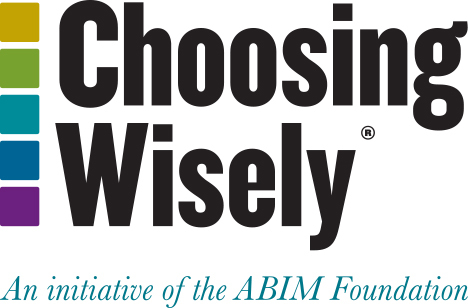 To date, more than 80 national and state medical specialty societies, regional health collaboratives and consumer partners have joined the Choosing Wisely campaign to promote conversations about appropriate care. With the release of these new lists, the campaign will have covered more than 250 tests and procedures that the specialty society partners say are potentially overused and inappropriate, and that physicians and patients should discuss. To speak with Dr. Steinberg, contact Michelle Kirkwood on September 22-25, 2013, in the ASTRO Press Office at the Georgia World Congress Center in Atlanta at 404-222-5303 or 404-222-5304, or email michellek@astro.org. To learn more about Choosing Wisely and to view the complete lists and additional detail about the recommendations and evidence supporting them, visit www.ChoosingWisely.org. ASTRO’s 55th Annual Meeting, held in Atlanta, September 22-25, 2013, is the premier scientific meeting in radiation oncology and brings together more than 11,000 attendees including oncologists from all disciplines, medical physicists, dosimetrists, radiation therapists, radiation oncology nurses and nurse practitioners, biologists, physician assistants, practice administrators, industry representatives and other health care professionals from around the world. The theme of the 2013 meeting is “Patients: Hope • Guide • Heal” and will focus on patient-centered care and the importance of the physician’s role in improving patient-reported outcomes and the quality and safety of patient care. The four-day scientific meeting includes presentation of four plenary papers, 363 oral presentations, 1,460 posters and 144 digital posters in 70 educational sessions and scientific panels for 19 disease sites/tracks. Keynote and featured speakers include: William B. Munier, director of the Center for Quality Improvement and Patient Safety at the Agency for Healthcare Research and Quality; Darrell G. Kirch, MD, president and CEO of the Association of American Medical Colleges; James Cosgrove, PhD, director of the U.S. Government Accountability Office; Otis W. Brawley, MD, chief medical officer of the American Cancer Society; and Peter Friedl, MD, PhD, of St. Radboud University Nijmegen Medical Centre at the University of Nijmegen and MD Anderson Cancer Center.